The Ultimate C combination boiler. Designed and manufactured at Glow-worm’s industry-leading facilities in Belper, Derbyshire. The straightforward, boiler range is easy to use & install and supported with a FREE 5 year warranty as standard. The Ultimate c combi boiler range is available in a choice of 30kW and 35kW models and features high DHW flow rates, flexible flue options and a stainless steel heat exchanger for proven reliability and performance. 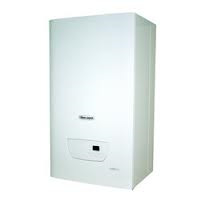 The Ultimate c boiler has a range of optional system and boiler controls and the pack is complete with standard horizontal flue. All models are available in straightforward and easy to order installer packs. Installation and servicing are made straightforward, with an LCD display using standard Glow-worm diagnostics, and easy access to both 24v and 230v wiring compartments. Give us a call or send an email to learn more about the Glow-worm Ultimate C combination boiler and prices to install. At Dales Plumbing we offer a 7 year warranty as standard with this boiler and for £150 extra can give an incredible 10 year manufactuers parts/labour warranty.